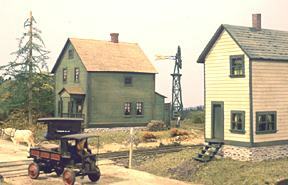 The company homes shown here are replicas of company homes from the Keweenaw found on my railroad. This is a short history on some of the types and styles of company houses found throughout the Keweenaw. Until 1887 the Keweenaw was an isolated outpost in one of the most environmentally harsh areas found on this continent. Heavy snow in the winter and ice-covered lakes prohibited almost all travel for six months out of the year. Today when we travel to this region we are most familiar with US-41. In the late 1800s and early 1900s travel into this region would have been by rail, either the DSS&A or the Copper Range. Before the introduction of railroad service, miners and developers would have used Copper Harbor, Eagle Harbor or Eagle River as the point of entry by boat using Lake Superior. Even with this, ships had to be built and reside on the lake in the days before the Soo Locks were built. The early harbor towns were more like camps. Most of the early accommodations for miners were large tents thrown up just outside of town to house the ever increasing population. These tents would be torn down in the fall and most of the population would retreat back to civilization for the winter. Only the extremely hardy soul would last the winter, without fresh food or communications. When spring arrived the locals who remained would spend a good part of each day waiting for the ice to break in hope of seeing the first ship of the new year. As mining locations developed, small mining communities followed. The Keweenaw was dotted with paternalistic mining societies. The mining company built, owned, operated and/or controlled the housing, hospitals, schools, local government and stores, and provided free land to build churches. Unlike some other areas of the country where companies controlled and choked the workers, the copper region was almost free of this form of indenture. The Copper strike of 1913-14 was an exception to this rule, causing the deaths of men, women and children. In the 70 years of mining history to that point the worst single accident claimed 30 men, all of whom were asphyxiated by smoke in the Osceola Mine. During the strike, 74 children died when they ran to a crowed exit after someone yelled "fire" during a Christmas party in the Italian Hall in Calumet. Men were murdered when they tried to go to work or stay away from it. It was not a good time to live in the Keweenaw, since your home was owned by the company you were striking against. Most of the time things were better in the mining communities. The company may not have provided company homes with indoor plumbing, but they built large bathhouses for the miners returning from the shafts and their families. The companies also built bowling alleys, ahtletic fields, and libraries, such as the Sarah Paine library in Painesdale (no longer surviving) and the company library for the C&H in Calumet (still a public library). The big three, C&H, Quincy, and Copper Range Consolidated were the companies to work for if you wanted to live a normal life of the times. In the early years before consolidation, the best living conditions a worker could hope for was a log bunk house with dirt floors. Many of these survived well into the 1940s and a few can be found even today. The earliest types of company houses were log structures, being the simplest to build and maintain. With many local sawmills popping up, most companies developed standard sets of plans for wood frame homes. Almost all the the money to develop this region came from Boston. One of the early books written about this region is aptly titled"Michigan Copper and Boston Dollars". Therefore it is easy to understand why there are so many saltbox houses in the Keweenaw, especially south of Houghton. The influence of Boston extends to town and street names like Beacon Hill, Concord City, Boston Location, Painesdale (named after William Paine, of Paine Webber of Boston, owner of the Copper Range Consolidated). 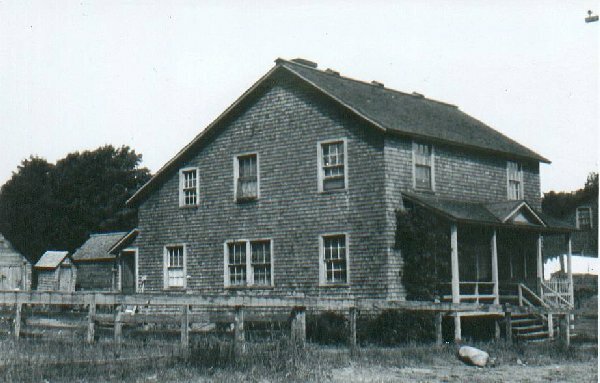 The stamp mill for the Champion Copper mines in Painesdale were located in Freda, which was named after Paine's daughter. Town sites were divided into areas called locations. The mines were also referred to as locations. In Painesdale locations were referred to by letters; A Location, B Location, etc. In other towns these areas would be given more interesting names, usually referring to the local population; Swedetown, Germantown, Hardscrabble, and Bumbletown (named after a bunch of clumsy miners,no doubt). Homes within a location usually would include no more than one or two styles - a block of single dwellings and a block of duplexes. Company houses ran from single dwellings, duplexes (usually side by side) to boarding houses for single men. Each mining community had at least one location for the supervisors and bosses - in Painesdale it is known as "Snob Hill" for obvious reasons. The construction of addition locations was tied directly to the richness of the mine being developed. The most distinctive addition to the main structure of a Keweenaw company home is the vestibule or "snow room", which is attached to almost all houses in this region. They were meant to be a place for dirty, wet men to change before entering the main house. Usually these are found in the back of the house, but through many modifications some have become attached to the front. Most of these homes are close together and never had garages, since most were built before the automobile. In the early days all the homes would be fenced in to keep stray animals away and the home dweller would have room for a small garden and one cow in the back. Large plots of land were also made available by the company for cutting firewood and growing additional vegetables. Men could earn additional money felling trees, as the mines never ran out of a need for timber underground. 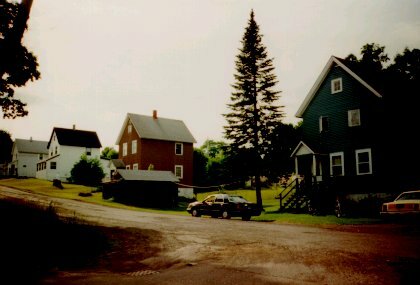 In some areas of the Keweenaw it is still possible to see rows of similar houses, without modifications. In others area, the passing of time has destroyed some, removed others, and renovated the remaining, as mining companies sold the homes after the mines shut down. Ideally there would be interest among local historians in preserving these homes. The mines, support structures, and facilities have long since disappeared, leaving the company homes as the only remaining examples of structures from the era.. When and if you visit, what you'll see is only a tiny fraction of what existed during the height of the mining era.. More than 95 percent of the company homes in Redridge were disassembled and moved after the two stamp mills on the Salmon-Trout River shut down. 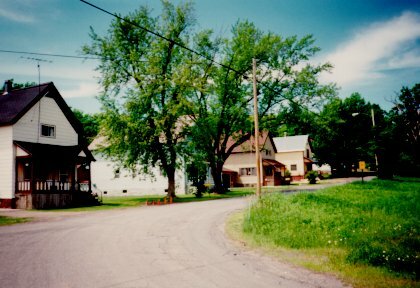 Almost all towns have had at least a few streets removed along with the homes. Apparently people in the Upper Peninsula are extremely fond of disassembling and moving homes elsewhere, making it harder for people like me to find how they got there in the first place. Many communities in the Keweenaw had paved streets and electricity years before the rest of the state due to the fact that mining companies needed roads and generated their own electricity. When the mines closed the homeowners lost their electricity and had to wait until the government caught up with them again in the late '40s and early '50s. Many towns had electrical power and lost it for 10 to 20 years until it returned. So much for progress. When Trimountain was first built 50 houses were to be erected. Chief engineer John Knox went to the top of the hill where the Hospital stood. Capt. Jim gazed out over the place, swung his arm in a wide arc and said "All right, Knox, put the 'ouses in 'ere". Then he walked away leaving it all to us. This story was related by Harry Mercer, long time employee of the Copper Range. I like this description because it reminds me in general of the industry-based mentality that built all of these company homes. Homes were only built when they were really needed as the companies rarely made any money off them. The employee was only required to cover maintenance costs. The Trimountain example was typical at the turn of the century, as companies scrambled to complete as many homes as possible before the first snow. In 1899, Painesdale camp #1 was a small group of log structures centered around the "first strike", located on the future site of the Painesdale depot. By 1902 the company had constructed 100 homes and a public school. The hospital in Trimountain was used by all Copper Range employees at the cost of $1 per month and every mine had a dispensary with a doctor and ambulance on duty. The Sarah Sergent Paine Library, named after William Paine's mother, was built in Painesdale. In addition to the library the building contained a pool room, card room, meeting rooms, public baths, ballroom and a stage,all of which were heated by excess steam from the mine hoist engines. The building, made of Jacobsville sandstone, cost the Copper Range $40,000 in 1903. Hundreds of baths per day were recorded from 1903 until t 1946, when plumbing was finally installed in company homes. The library stood until 1962 when it was condemned. By this time all of the company owned homes of Painesdale were being sold off to the public for around $775 a piece. In the South Range region the "Trimountain house" was a standard, containing six rooms. Since many families rented rooms to boarders, the rooms were arranged so that each bedroom could be accessed from the central entrance. The homes were 21' by 25' and were covered in clapboard or wood shingles, with a mine rock foundation. Typical construction costs were from $1,000 to $1,500. These homes rented for about $5 per month in 1913. 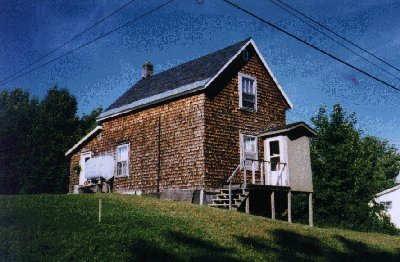 The Trimountain-style house can be found in Atlantic, Winona, Painesdale, Baltic and South Range. I will publish plans for this house one day as I have to build 10 or so of them. The double-houses can be found most easily in Trimountain today, but were also a favorite among mining companies as they could be built for as little as $1,200. These homes generally went to smaller families. Interlaced with all the data regarding the building and removal of company homes is the story of the mining communities which have developed out of these frantic building sprees. Although it is hard to imagine today, all of these communities were self supporting and thriving with local bands,hockey and baseball teams, church societies, temperance halls, movie theaters and bowling alleys. For relaxation, miners and their families had Electric Park in the north and Freda Park in the south for wonderful summer picnics. Access to the parks was by rail car on special extra trains that only ran on Sunday's. With the arrival of the automobile in the early teens, the railroad could no longer make money running to the resorts as so abandoned them.